Next month, it will be nine years since Max got his stem cell infusion (there he is at 6, above). And it will be one year since Max had surgeries to straighten his right foot and reduce the flow of saliva. We are not sure the stem cell transplant was a success, but we're glad we did it. We know for a fact that the surgery to control drool was a fail, and I have some guilt about having gone through with it. We knew last year that we needed to do something about Max's right foot, which was turning in. A surgery called Selective Percutaneous Myofascial Lengthening (SPML) can help by basically releasing tight tendons. During a consultation, the doctor recommended a colleague who does a procedure called a tympanic neurectomy; it involves severing nerves that feed into the salivary gland, which would be accessed through Max's ears. It could be done right after the foot surgery, so Max would only go under anesthesia once. The doctor said that while he'd mostly operated on younger patients, he thought Max would get good results, and there were small studies that showed it could be effective. I checked in with Max's other doctors, who thought the surgery was worth a try. Something weird happened with the saliva surgery: the doctor came into the waiting room and told us everything was fine, but he had not been able to find one of the nerves he needed to sever. Yes, could not find. He said it could have melded to the bone. Otherwise, Max was doing well. He'd sustained a small puncture in his ear drum, but it would heal, he reassured us (and it did). He offered to revisit the surgery, but we never did. We weren't game to have Max go under anesthesia and let the doctor invade his ears and glands for a procedure that could very well fail again. Dave and I had known about behind-the-ear patches, scopolamine, that could help. They're the same ones used to treat sea sickness; one of their side effects is that they dry up your mouth. But we'd thought it would be for the best if we could find a permanent way to alleviate the drooling, why we went for the surgery. The patches are doing their job—not completely, but enough. Still, I have a guilt hangover that the surgery didn't work, and that we put Max through an unnecessary procedure. The drooling doesn't bother him—he doesn't much notice it—but it's going to become more an issue when he gets into the work world. Already, it's one of the things that makes other people stare although he doesn't notice that, either. Being the parent of a child with disabilities means shouldering heavy responsibilities, including making medical decisions for your child. We've always been of the mindset that if it couldn't hurt and it might help, we'd try it, and we forged ahead in that same spirit. For the first time in my life, though, I've felt dubious about a decision. I don't feel that way at all about Max's stem cell therapy. We had the cells, which we'd banked at birth just in case. The procedure, done at Duke University by the wonderful Joanne Kurtzberg, went seamlessly. We didn't see any major changes in Max afterward, but he just kept progressing. We will never know how those stem cells helped him, if any, although a couple of promising studies have subsequently emerged, including one last year that showed brain connectivity and motor function improved in children with CP one year after a stem cell infusion. I guess that's the way it goes. You use your best judgment. You hope you are doing right by your child. But you won't always be so sure. My son had surgery 4 years ago to straighten his feet and lengthen his Achilles tendons and his hamstrings. 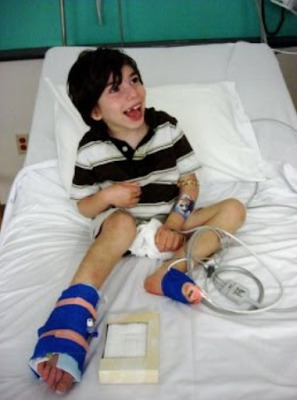 He was in casts to his thigh for 12 weeks, and he had terrible pain and fear for months after the casts came off. As hard as that recovery was on our whole family, it was worth it because he walks so much better. He still has a wobbly walk and walks better with leg braces, but his speed and gait are so much better than they would be. But we still feel bad about the poorly managed pain. The Disability Blogger Weekend Link-up: post!